Northern Arizona is a terrific place to visit—especially if you are a photographer. 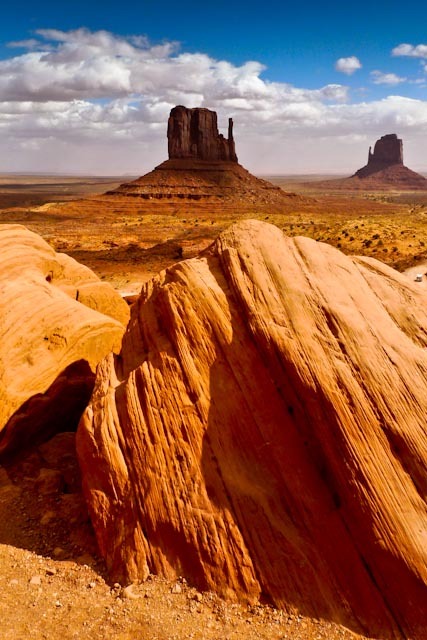 One of the most photographed areas there is Monument Valley. One tip I picked up from photographer Rick Sammon’s Blog is to look for a photo composition that is different from the one most people see in print somewhere. In other words, when visiting a popular tourist location like Monument Valley, Arizona, don’t shoot the typical “post-card” image. This was my intent when I captured this view with my Panasonic LX3 pocket camera last Fall. The weather Gods smiled on us that day, because there were nice puffy clouds present early in the morning when we arrived. Also, after we finished viewing all we wanted to there, a dust storm of epic proportions arrived. Had we gotten there a few hours later than we did, it would have been tough to get any sort of decent image. Given that we’d come from so far away to be there, disappointment would have been written all over that portion of our 2-week journey to Arizona.